Compositech manufactures the highest quality drainage belts available for vacuum filtration. Using premium quality materials in our uniquely designed molds, our belts are produced with optimal physical properties. We make each drainage belt of heavy-duty conveyor belt textiles with a 12:1 safety factor and with a proprietary elastomer formulation. The compounds we use in our manufacturing process are designed for drainage belt applications and are modified to meet our customer’s specific chemical, thermal and abrasive needs. The high quality materials we use are far superior to “off-the-shelf” cut belting with vulcanized covers and lips. Compositech produces drainage belts in specially designed molds which form the drainage grooves, lips, and center ribs. Molding the entire shape of the drainage belt allows us to tightly control belt straightness and dimension. In vacuum filtration, uniform product is obtained by precise construction. Our goal is uniform construction to ensure properly centered drainage holes which allow a consistent application of vacuum. The symmetric drainage channels on our belts result in a consistent hydraulic and pneumatic capacity and provide an unmatched amount of open area on a drainage belt top surface. Compositech drainage belts, with 1/8” lands between grooves, are far superior to the minimum 1/4” lands possible with machine or hand cut drainage grooves. To maximize the capacity of our drainage belts in specific applications, we offer a variety of drainage hole configurations including several patterns of slotted drainage holes which result in increased hydraulic capacity or pneumatic capacity of the filter. The tensile strength of each belt is designed to match vacuum and product load. 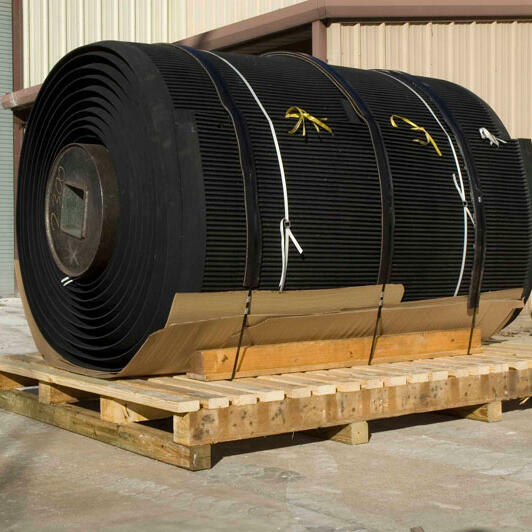 With drainage belts, a majority of the load is due to the friction drag produced by the vacuum seal. A smaller amount of the load is produced by the weight of the product on top of the belt. Compositech understands this relationship and we design belts to operate within the loads characteristic to each size of machine. Compositech designs wear strip alternatives to enhance the performance of your filter. Compositech wear strips and slide strips increase the efficiency of horizontal belt filter operations as they provide the lowest coefficient of friction available for this application. Our strips come in several configurations specific to different maintenance cycles and they are available in several styles to suit the particular filter you have in operation. Stepped Slide Strips were installed on every first generation Eimco Extractor produced. When first introduced, these strips provided a Teflon low friction surface on which the center rib of the drainage belt would ride. The introduction of Turcon, corrected several weak points of the original black Teflon strips and has become a high performance wear strip for a majority of applications. Compositech took the standard stepped strip and increased the total thickness to 3/8”, effectively doubling the expected life of the strip. Accessories for stepped slide strips include stepped end seals, stepped pan lip seals, vacuum breaker strips, and vacuum pan baffle strips, all of which are supplied by Compositech. 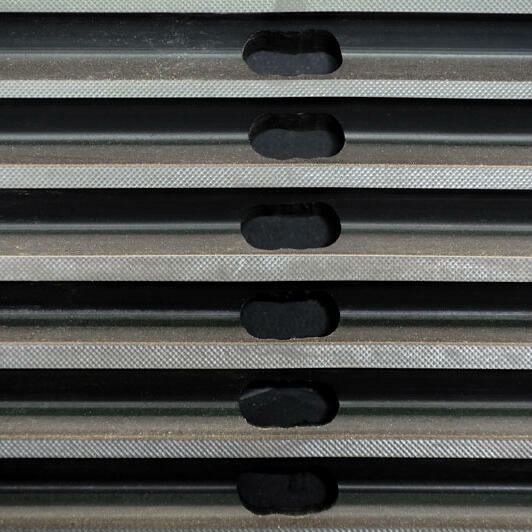 Many horizontal belt filters, including several Eimco Extractor models, utilize flat plate wear strips made of Teflon, Polypropylene, or UHMW-PE. These strips are usually rather crude items cut from large sheets of material and fit specifically to each machine’s vacuum pan. Straightline and Ametek filters utilized this style of slide plate. 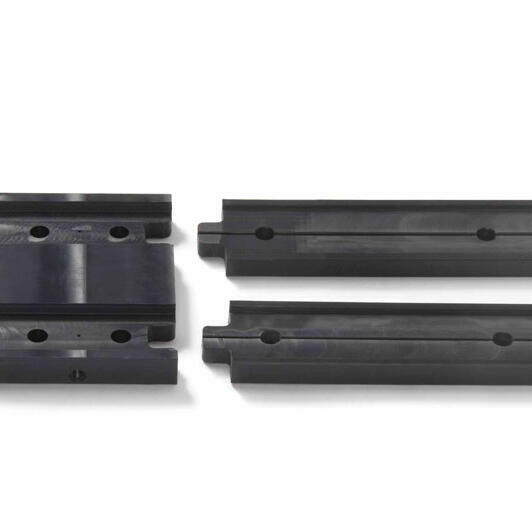 Although Compositech supplies machined versions of these types of plates, we usually recommend conversion to the stepped slide strip design described above. An exception to this is the series of horizontal belt filters produced by Ametek and Eimco which have a wide center rib or flat belt. For these machines, we always convert to a filled Teflon material which ensures the plate wear strips are abraded away without causing damage to the underside of the drainage belt. The introduction of wear belts in horizontal belt filters solved a number of problems inherent with rubber sliding on plastic. With wear belts, the slide strips become a long life component and the wear belt becomes the sacrificial element. 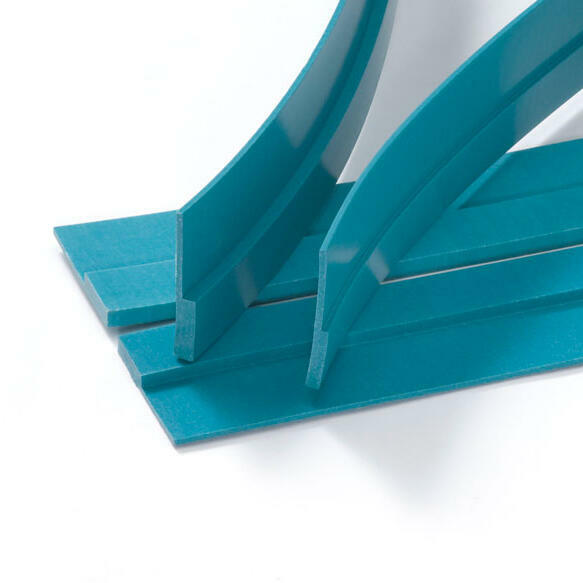 In this configuration, the wear strips can be manufactured from low-cost, high wear UHMW-PE instead of Teflon. The wear belt is manufactured with a hard fabric wear surface such as nylon or polyester. This surface slides easily on the UHMW-PE with very low frictional drag and thus very low wear unless abrasive materials are introduced by the process. Wear belt slide strips feature a slot to maintain alignment of the wear belt lubrication ports to allow the introduction of lubrication/sealing water to the mating surface of the wear belt and wear strip and t-slots for mounting which allow for near perfect fit and alignment. Compositech has converted several older style machines to wear belts and virtually every new machine we build features this design.